Our 2018 Annual Meeting gathers Leapfrog’s constituency of employers and other purchasers, health plans, policymakers, consumer advocates, leading researchers and clinicians, and senior hospital and health system leaders. The central topic this year is best practices for rating surgery provided in hospitals or ambulatory surgery centers. 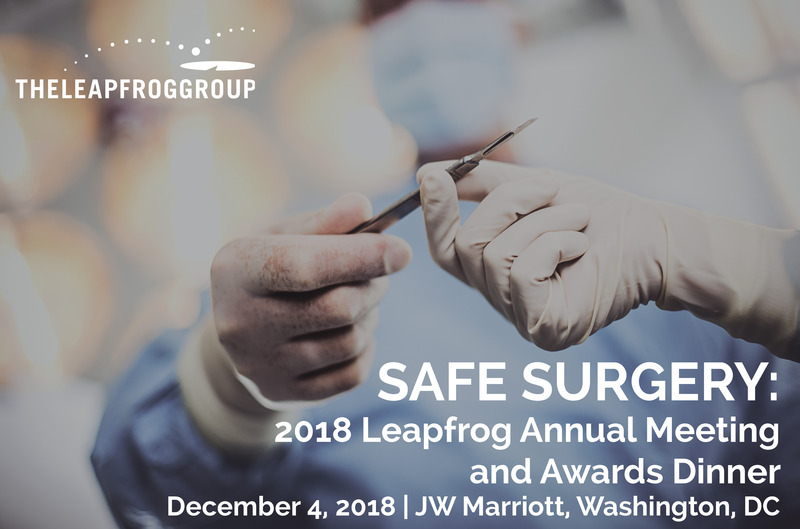 As part of this, we’ll share exclusive data from Leapfrog’s new measures on inpatient hospital and surgeon volume, and offer a briefing on Leapfrog’s upcoming launch of ratings of hospital outpatient surgery and ambulatory surgery centers. Following the Annual Meeting program, we’ll honor the achievements of the 2018 Leapfrog Top Hospitals, approximately 100 hospitals in four categories, at our annual Leapfrog Awards Dinner. Vice Admiral Raquel C. Bono is a surgeon and the Director, Defense Health Agency (DHA), Defense Health Headquarters, Falls Church, VA. She has been named by Modern Healthcare among the 50 most influential physicians and 100 most influential individuals in health care in the United States. She led groundbreaking innovations in quality and safety of surgical care at the DHA, which has worldwide impact on surgical training and practice. She leads a joint, integrated Combat Support Agency enabling the Army, Navy, Air Force, and Marine Corps medical services to provide a medically ready force and ready medical force to Combatant Commands in both peacetime and wartime. The DHA directs the execution of ten joint shared services, among them the health plan (TRICARE) providing worldwide medical, dental and pharmacy programs to more than 9.4 million uniformed service members, retirees and their families. Commissioned in June 1979, Vice Adm. Raquel Bono obtained her baccalaureate degree from the University of Texas at Austin and attended medical school at Texas Tech University. She completed a surgical internship and a General Surgery residency at Naval Medical Center Portsmouth, and a Trauma and Critical Care fellowship at the Eastern Virginia Graduate School of Medicine in Norfolk. Shortly after training, Bono saw duty in Operations Desert Shield and Desert Storm as head, Casualty Receiving, Fleet Hospital Five in Saudi Arabia from August 1990 to March 1991.